This past week has been physically taxing! A week ago, I linked up with One Room Challenge to make over one room in my house over a six week period and document the progress. 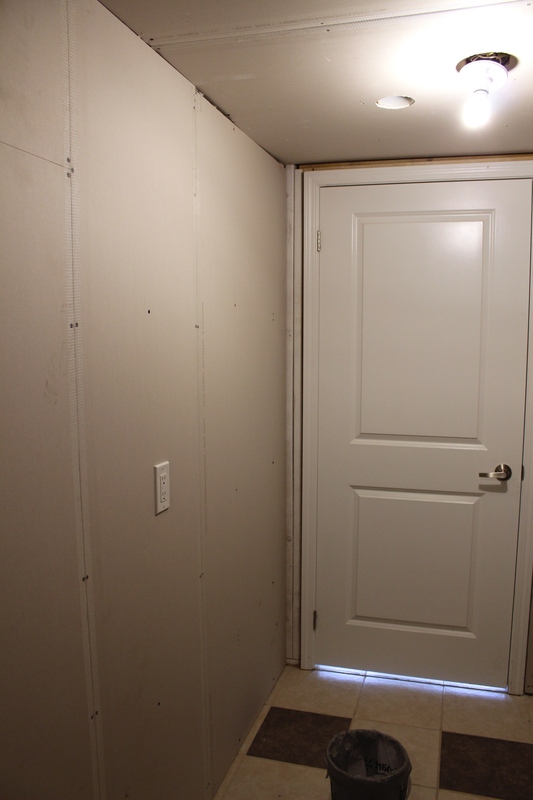 I was so excited to tackle our laundry room and get it completed, but before I could get to the fun part (shopping for paint, shelves, and other decor to put some life into this space) we had to put up drywall, tape the seams, apply compound, sand the seams, apply compound, sand the seams…and once everything was smooth paint the entire space with two coats of primer. With the help of my dad we got a lot done this past week. 2.) 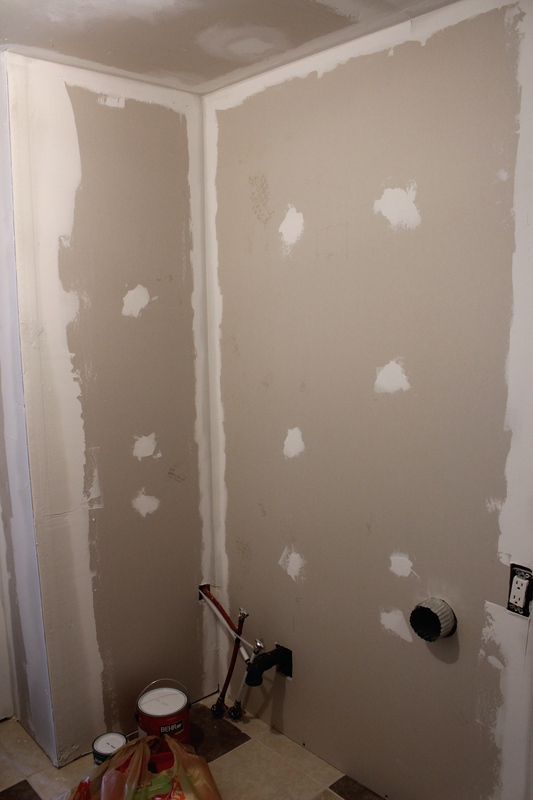 We put up drywall and started to tape, apply compound and sand. We did this about three times to make sure all the seams and corners were just perfect (or near perfect). This was my least favourite job! 3.) 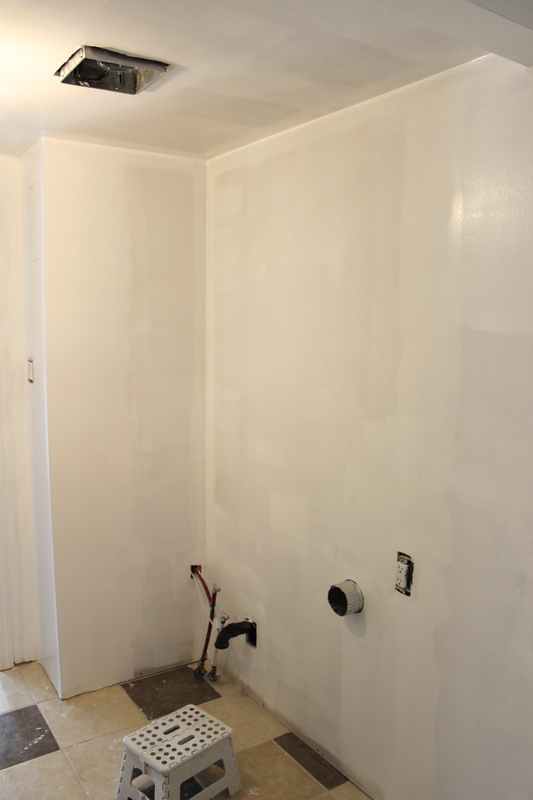 Next, we painted the entire space with two coats of primer (the picture shows just one coat of primer). 4.) 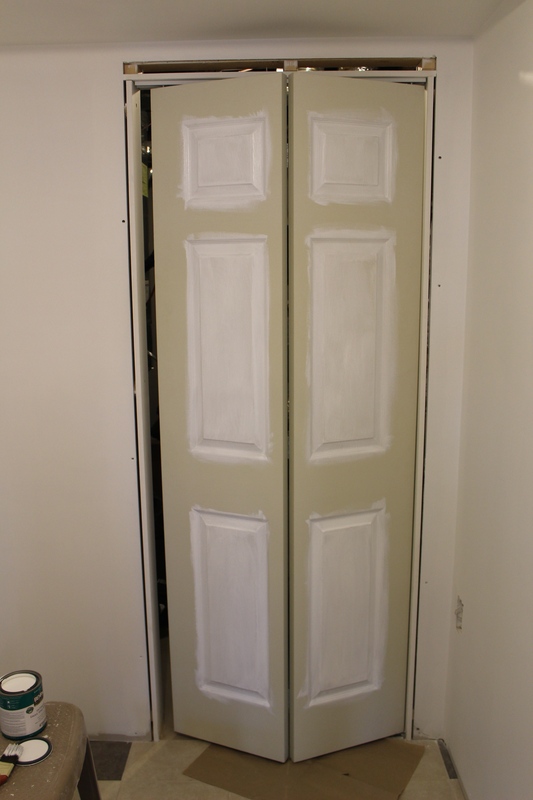 Since we opted for the less expensive folding door that came in an ugly green/khaki colour I decided to paint it pure white with trim paint. It’s a good thing the paint dried fairly quickly so I was able to do about three coats in one night. 5.) 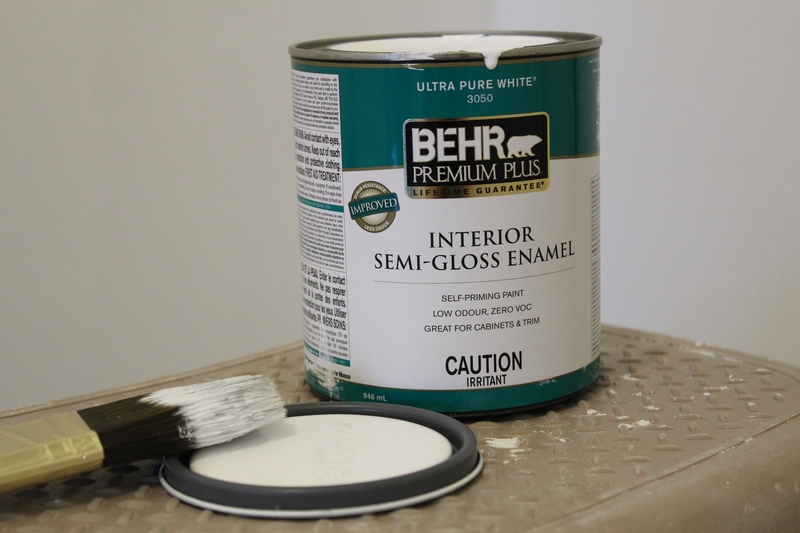 Finally, we got to paint the entire space with our chosen colour from Benjamin Moore. Last week I mentioned that I was going for a fresh feel and look –perhaps a pale sky blue or sea foam green. After careful consideration we decided to go with Genesis White. When we opened the can of paint I was confused. I thought they gave us pure white, but when we tried it on the wall you could see a tinge of grey. In fact, it looks like a very pale/baby blue grey. I love it! It has a very spa-like and calming feel to it. Stay tuned to see more next week and don’t forget to check out the other participants’ projects! I haven’t seen many laundry rooms on the ORC! Very excited to see what you do! It’s looking good so far Paulina! Can’t wait to see what you do next! You have made amazing progress! Good luck with what you have left to do. Wow! You got a lot done this past week! 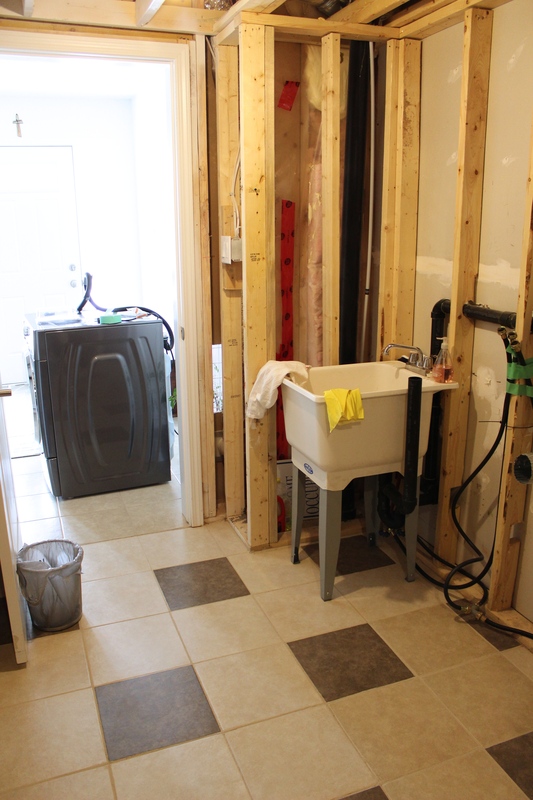 You’re farther along in your laundry room project than I am! The drywall looks so good! Thanks Sam! My fiancé had the week off so we worked on the laundry room all week. We are so tired but happy with our progress 🙂 Cant wait to see yours as well! Wow, you got a lot done! I’m only halfway thru my drywalling and dreading the sanding part,its the worst! Hi Rebecca. Not going to lie sanding was the worst! I was covered in fine white plaster dust. I did have a mouth mask but probably should have had safety goggles too…I read the packaging after and it said its not toxic or hazardous soooo…I’m hoping I don’t have any long term side effects. I love your blog–you’re super funny! Cant wait to see what you do with your space next week. 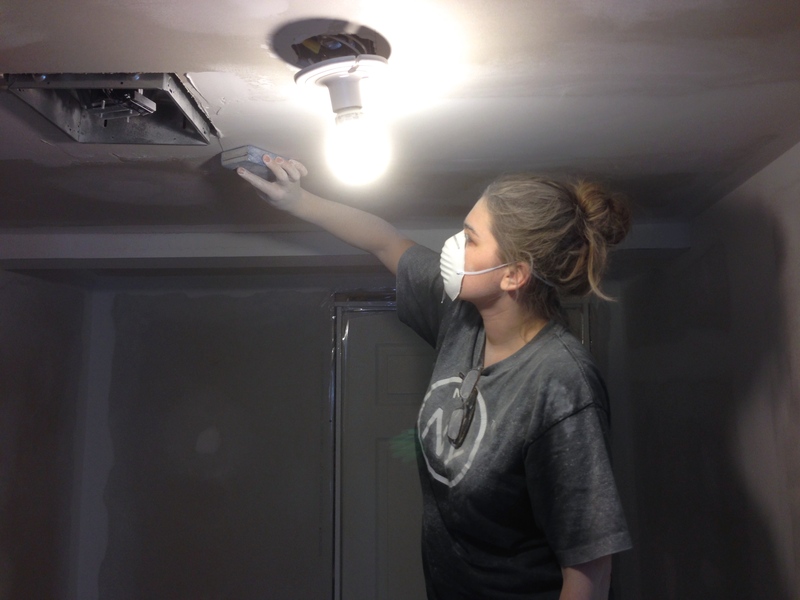 I did drywall repair in my laundry room this weekend too. It. Was. Not. Fun. As in yuck. As in I’ll never do it again. Love how its turning out so far! Kimber I couldn’t agree more! I never want to put up drywall again. 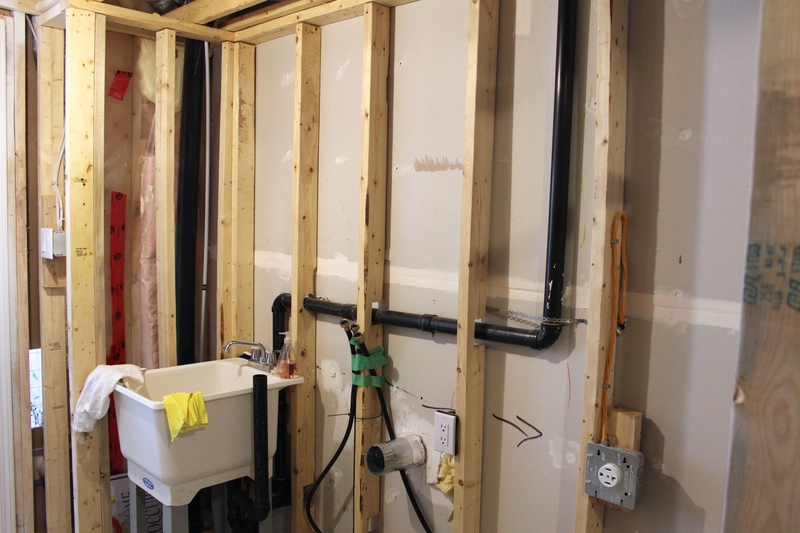 Although it did make all the difference….now on to the fun part! 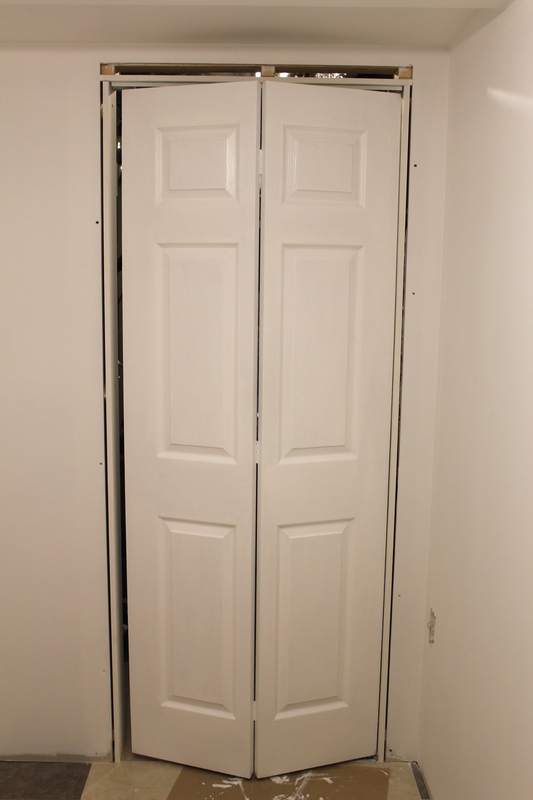 Cant wait to see what you do with your space! I can appreciate what a huge job this was. You must be exhausted, but it will be worth it. Good luck. Thanks Linda! It’s looking really good far–I’m very happy with it. Can’t wait to see the other ORC participants’ progress tomorrow! wow! you may win the award for most accomplished in one week, that is a huge job!! hahah thanks Tara for the words of encouragement!